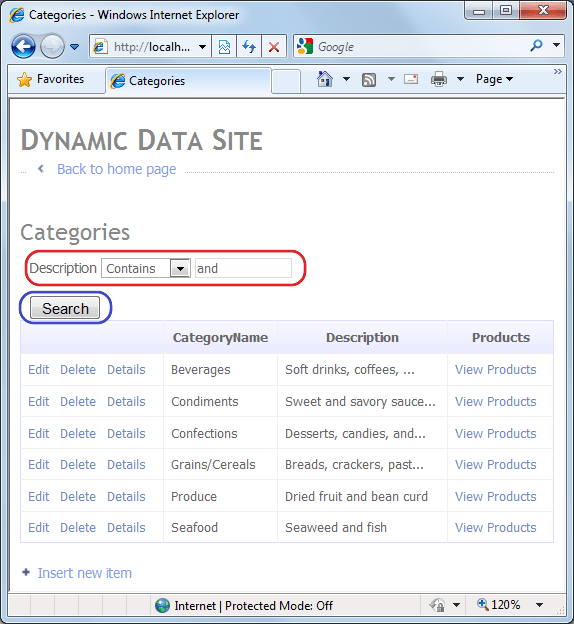 I’ve implemented a Filter to apply on text fields in ASP.NET Dynamic Data websites. To use it: include the code in your project by putting it in the DynamicData\Filters folder. Then apply the filter to the field you want to enable filtering on using the FilterUIHint attribute. If you want to see it in action, you can download the full sample code, which is based on the famous Northwind database on SQLExpress. I got a lot of inspiration and help from msdn and this blog post to get to a decent implementation for this. Like always I’ve compressed the code using 7-zip. The best compression tool. Ever. How can I use case in-sensitive search ? Please kindly advise. If I test the code, it seems to be case insensitive on my machine. However that may be due to how the database handles the query. If you are using another data source, that may indeed be a problem. Note that another option is to have a “UPPERCASE” version of the field you want to search on in the database, do the search term to uppercase, and compare to that field in the database. This is probably the best way to do it, if you’re having issues getting it to work. The down-side is, that it takes some space on the database. Approach 3: how can i include both GetMethod “toUpper” and “Contains” in the same Expression.Call statement ? Sorry for my newbie questions Thanks again for your guidance. so i need to do it on the coding level …..
the rest is the same as the original implementation. You need to make sure that you apply the search field to a column that has been “pre-calculated” in the database to be all Uppercase. You could use ToUpperInvariant() as well. Thanks Jeroen again for your kindly help. The google search rank of this post has become higher now. Great! EDIT: –> I remove your urls, as they are not pointing to anything relevant. I see this as spam, so please don’t do it. ps. I haven’t tried with your project since I don’t have the NorthWind Database. Thanks for a great initiative! Make sure that you apply the FilterUIHint attribute on the right property, and that the class that contains the property is \glued\ to the generated partial class with the MetadataType attribute, like in the example. Also make sure that you have the ascx and code behind file for the user control in the right location, namely Filter. You can download Northwind for free, link is in the post. Easy to setup, just copy and paste the Northwind.mdf and .ldf file in the App_Data folder, double click and there you go. Good luck, let me know if you have trouble getting it going. I do not work .. Followed step by step the tutorial but the only thing I see is the “Search” button. I do not see the TextBox (TextFilter.ascx). Try running the full example, for which I include the source code. If you still have problems, I can’t help you without seeing your code.